Cypress, CA - January 6, 2016 – Yamaha Motor Corporation, U.S.A., is excited to re-introduce its Factory Supercross Team, which is officially named Monster Energy/360fly/Chaparral/Yamaha Factory Racing. The team’s corporate partners include Monster Energy; 360fly, Inc.; Chaparral Motorsports; and Valli Construction, Inc.
With his signature #22 number plate emblazoned on his 2016 Yamaha YZ450F, legendary Supercross rider Chad Reed will, once again, race for the Yamaha Factory Supercross Team, beginning this Saturday, January 9, as the 2016 Monster Energy AMA Supercross season gets underway at Angel Stadium in Anaheim, CA. In 2004 and 2008, Chad won two AMA Supercross Championships while racing for Yamaha. Keith McCarty, Motorsports Racing Division Manager for Yamaha Motor Corporation, U.S.A., commented, "All of us at Yamaha are proud to re-introduce our Factory Supercross Team. We’ve had a long-standing relationship with Monster Energy in road racing, and we’re thrilled to be able to expand our successful partnership to now include supercross. We also welcome back old friends Chaparral Motorsports and Valli Construction, and we welcome new partner 360fly. 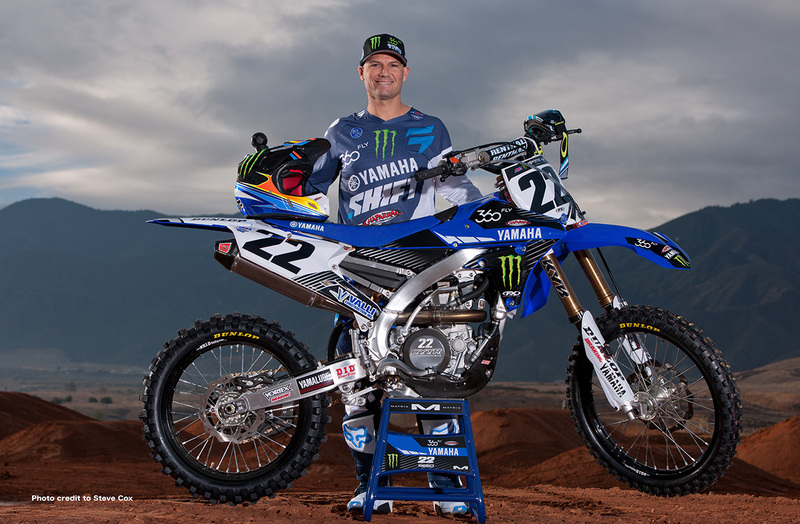 And, of course, we’re also very excited to have Chad Reed back with us again as one of our Yamaha bLU cRU riders." "There's no place like home right?" Chad said. "With Yamaha and the whole crew here, it definitely feels that way. I have amazing history here, but really, it's about looking forward and what we can continue to build together that motivates and excites me the most. I'm thankful for all my sponsors, especially Yamaha, Monster Energy, 360fly, Chaparral Motorsports, and Valli Construction for bringing back the Yamaha Factory Supercross Team for 2016! It's something special for 22, and for all Yamaha bLU cRU fans! One thing that hasn't faded with age is my passion for racing, and being on the gate with the best in the world. I've never felt more determined and excited to be a part of it." Monster Energy is a world-renowned, premier energy drink and global sponsor of action sports teams and extreme athletes. The brand has been a long-time sponsor of Yamaha’s Factory Superbike Team--Monster Energy/Graves/Yamaha--which competes in the MotoAmerica AMA/FIM North American Road Racing Championship. 360fly creates unique, 360-degree digital products that inspire users to capture, share, and experience life’s greatest moments in 360 degrees. They offer the world’s only single-lens camera that captures stitchless 360-degree video with interactive and virtual reality viewing capabilities. Throughout the Supercross season, fans will have an opportunity to check out the innovative 360fly camera unit on display in the Yamaha Factory Supercross Team’s pit area. Chaparral Motorsports is not only one of the largest motorcycle accessory and vehicle dealerships in the U.S., but they’re also one of Yamaha’s top volume-selling dealers. The company has a rich history in supporting motorcycle racing. Led by Dave Damron, Chaparral was the first non-factory team in history to win a Supercross Championship. In fact, the team won three Supercross Championships in 1998, 1999, and 2000 with Jeremy McGrath aboard a Yamaha YZ250. Valli Construction is a full-service general contractor based in Pleasanton, CA. Founded by Chad Lanza, Valli builds retail facilities, industrial/office condos, parking structures, and high technology projects all over California, Texas, and Washington. Valli Construction has been a team partner with several Yamaha Supercross teams over the years.